When is the big picture more relevant than the details? When is it more important to display generic patterns than to allow precise comparisons? And when should you strive for impact, besides clarity and insight? Those hard questions, which lie at the core of The Functional Art, came back to me while comparing two news stories published almost six years apart from each other. 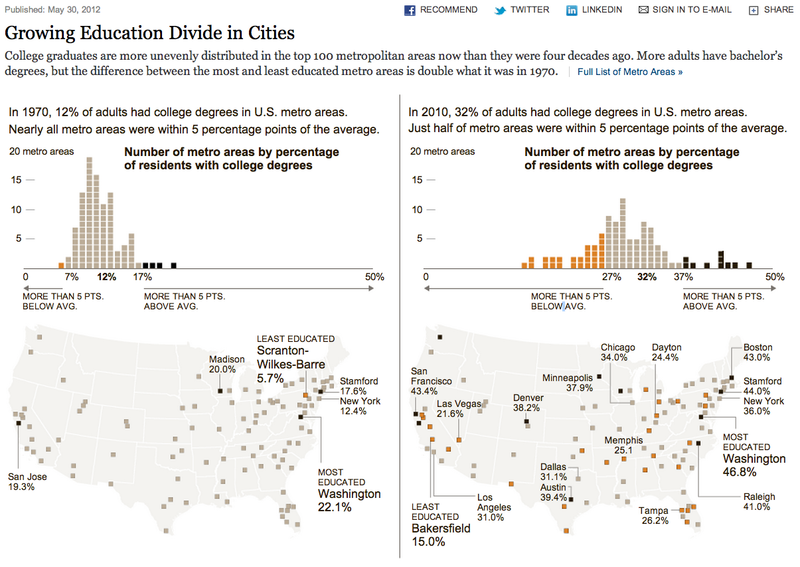 Both deal with the increasing clustering of college graduates in certain urban areas in the US. This is a problem for the rest of the country: the less educated the population in a region is, on average, the worse that region usually scores in many negative indicators, and the less innovative and productive it tends to be. This piece is from The Atlantic in 2006. This other one was put online by The New York Times a few hours ago. The two stories include charts and maps, but the graphics are quite different. At the bottom of this post, you can see the two maps from The Atlantic. Read the chart by NYT below this paragraph. Which one would you prefer if you had to write a story like these? I don't have a clear answer to that. I love graphics that, to be decoded, force you to invest some energy, and offer satisfying insights in exchange. This is the case of the NYT histograms (the maps there are not great): once you understand how they work, they are striking. As Kaiser Fung (Junk Charts) has pointed out, "the histograms clearly and forcefully demonstrate two points: the almost three-fold increase in the concentration of college graduates in metropolitan areas, and the wider spread in geographical preference". But, and here's the key thing, The New York Times graphic's impact is noticed only after you get the mechanics of the histogram. I would argue that a large percentage of readers are not able to read this kind of graph intuitively (1). But they certainly can understand two choropleth maps with no effort, particularly if you put them side by side. Compare 1970 (left) with 2000 (right). Can you notice how many counties empty from college graduates in those thirty years and became paler, while some small scattered portions of the map grow redder? The message, at least for me, is immediate: college graduates flow away from most regions of the country and pour into metropolitan areas. Maybe both approaches could have been combined into a single graphic? 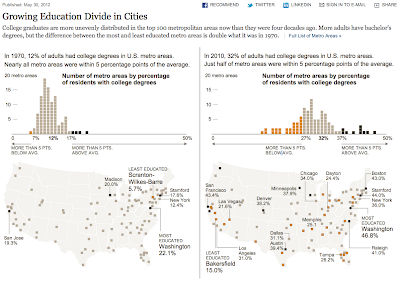 The histograms from The New York Times and maps like the ones from The Atlantic? Would you then have the best from two worlds? (1). Just in case: this is NOT an argument for avoiding histograms in news stories, which is what some managing editors would tend to do, thinking that their average reader is dumber than they are (quite the opposite is usually the case).